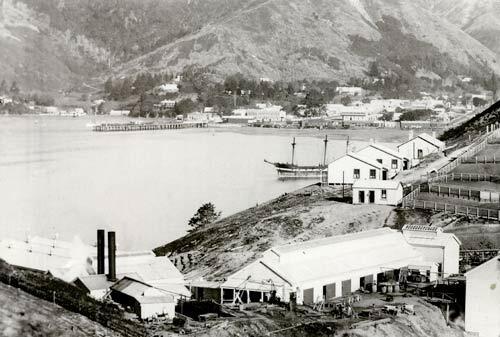 Picton’s freezing works commenced operations in the 1900–1 season and was a major employer in the town. Its harbour-front location was common for such works, facilitating the shipping of the frozen carcasses. The Edwin Fox sailing ship – the centre of a Picton museum in the 2000s – is visible in the centre of the picture. The boilers used in the freezing works came from the Edwin Fox. The works closed in 1983.